Before we dig into today’s featured Indiana blogger, I’d like to take a look back. Once upon a time, more than eight years ago now, my husband had gotten out of the Navy, and we were pining for somewhere of our own to live. Finding a job was almost impossible. All of our things were in storage, except what precious little we could pack in the car, along with our 18 month old son, and two cats, for the long return home to Indiana from Seattle. While my father-in-law served out his first tour in Afghanistan, we took over his place. In the agonizing, unexpected six months it took for my husband to find a job, we did nothing but dream about our own home. When it finally happened, I began house shopping online. I made a wide sweep of the area, looking for space and character. When I saw our 1901 Victorian home, I knew that it was The One. 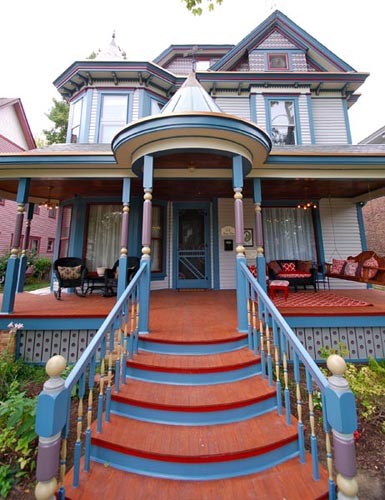 Other than a good foursquare home, I do love, and have always loved, that Victorian architecture! There were wood floors underneath all of the fading carpet and linoleum. There were two stained glass windows. There were (and are) huge windows, pocket doors, detailed hardware, an upstairs kitchen that could come down and make a pretty good office space for me, and a third floor with lots of potential. Unlike the fabulous blogger I am getting ready to introduce to you below, we had no idea how long the work would take to complete. It was our first home and we were blown away by its grandness. We ripped up the carpet, we put down new floors in both bathrooms and my office, and new bathroom stuff in general. My husband refinished floors and recently made a fence of reclaimed wood that still seems to be the talk of town. We took down a wall that had been put up in order to open the front parlor up again. I painted and painted and painted some more. My husband got the basement cleaned up and has fashioned it into his woodworking shop for the handmade building blocks tables he makes. Oh, yes, I will be sharing more about that one (and they are even going to be carried in local shops, available online, and maybe even near you!). Looking back, I want to take a nap! I can’t believe how different the house looks now (and we admittedly have projects left on our list–like installing built-in shelves with a window seat in the playroom). My 3200 square feet (the third floor isn’t in that) don’t compare to what Amy and her husband, Doug, had in store for them. They purchased a 4,700 square foot home in the kind of condition that would make many folks walk away, if not run. But, Amy and Doug had a vision. Okay, Amy fell in love with the house first, Doug knew that was that, and then they had a vision. But still. They both saw the potential and, fortunately for them and the house, they knew it would take plenty of work to get it to where it should be! Sure, they may get frustrated from time to time, but they are a team, good with power tools–and definitely up for the job! When I started reading Amy’s blog, Vivacious Victorian, I thought, “A kindred spirit!” I knew that she was a blogger that you would love to meet as well. They are a wonderful resource for anyone interested in renovating their own home. What about that name? Why Vivacious Victorian? I’m a big fan of alliteration. “Vivacious” means happy, lively, animated, merry…. all things that (hopefully!) describe me. We’ve been lucky to meet some of the former owners, including Jim Bryant. Jim’s grandfather, Roy C. Bryant, was the mayor of Franklin, and a very important business man and builder in Franklin and Indiana. Jim would tell of dinners and gatherings and social events that all happened in our house, so to me, “vivacious” is really how the house SHOULD be. It should be lively, full of people and exuberance…. and our hope is to save the architecture, and bring back some of that grandeur of the past. And host LOTS of dinner parties. What are three of your most favorite posts? The Twelve Step Process of Renovation – Because we’ve all been there. A Glorious Pictorial Timeline – Where we were gifted old pictures of our house for the first time! Find the Shoe – Because I LOVE to tie Victorian Era culture into what we’re doing – or finding! What keeps you ready and raring to post? Why do you blog? I started to blog at the encouragement of my friends and family. I posted pictures of things on Facebook, sometime with little quips, and so many people wanted more details, more how to, more stories…. it really evolved from there! What I didn’t expect is how much it would connect me with other restorers across the country. It’s nice to know that others are having the same joy or frustration as we are. I get so excited about the things we discover, or the tricks we’re learning along the way, that finishing each stage of a process by writing it all out makes it seem official! It’s almost like I’m keeping a journal of what we’re doing, but everyone is allowed to read it. And to be honest, sometimes when we’re in the thick of a project that isn’t going well, or seems to overwhelm us, it’s nice to look back and remember that other projects had those bumps, and ended up working out beautifully. It’s also funny how hilarious “the grass is always greener” gets when reading about other people’s houses. I’ll lament that someone has the dumbwaiter I always wanted, and they in turn get jealous that I have a turret and balcony. It’s ridiculous. What can people expect when they hop onto your blog? Hopefully a place to laugh, a place be inspired to both create amazingness and make mistakes, but mostly, a place that encourages and supports historic preservation. So many people think that restoring or rescuing an old house is only for people with unlimited funds, or for people that can hire other people to do the work. I want to show people that if they see a crumbling building in their town, it’s worth saving – and they absolutely can do it themselves by learning and asking the right questions. If one person is less scared of a renovation because we’ve made it feel accessible, then I am beyond thrilled. You write that your blog is “a blog about our adventures in Renovation and Historic Preservation.” How did your adventure in renovations begin? I student taught in New Philadelphia, Ohio, which has an abundance of old homes. I first fell in love with the pretty ones, and over time, fell more for the ones that needed more love and were in disrepair – I would see them and think, “Wow – this house could be GREAT.” When my husband and I got married, we both loved the idea of an older house. The first one, in Ohio, didn’t need much work. When we moved to Indiana, we had some simple projects to do, and were quoted astronomical amounts to have them done. Doug loves research and hands-on projects, so he talked me into letting him skim coat a bathroom, because we didn’t have the money to hire out. He did an incredible job, and that just led us to more projects we felt comfortable researching and tackling. Looking back, would you say that you always had a fascination with things that were old and “needed love?” Do any homes or historic buildings in your past stand out? I don’t know if I always did, but once I started falling in love with architecture in New Philadelphia, I did from there on out! I rented an apartment my first year of teaching, after completing my student teaching. It was an old Victorian that had been chopped up into three apartments – I had the top floor and the attic. The attic wasn’t finished, but it was my favorite. I just loved the wood and the beams and the possibilities. And, that place had a clawfoot tub, too. Heaven. When you purchased your current home, did you have any idea of the work that was ahead of you? Absolutely. We knew we wouldn’t know everything that was wrong with it, but we absolutely knew that we were getting into a huge project. We’ve lived in four houses, and the first two changes were because of moves in jobs. 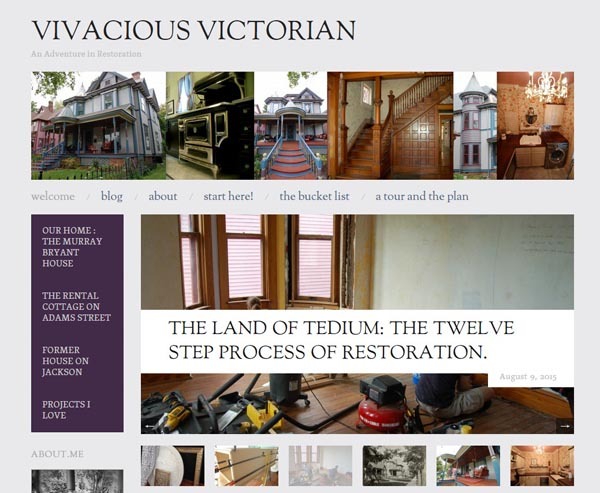 The Victorian – our current home – was three blocks away from the house we thought we’d stay in forever. But when it came on the market, we wanted to see it. And once we went inside, it was love at first sight. Both of us truly believed that no one else would be crazy enough to take on a project that big, so we knew it was our job to save it. Each house we’ve lived in has taught us about restoration and how we live – so we weren’t scared at all to take on the project. Knowing if we’d have enough money or time is ALWAYS scary. But the actual project doesn’t scare us. We were totally ready for it. This – we hope – is our forever home. So we’re trying our best to do it right. What is your favorite feature or room in your home? This is the hardest question ever, and completely unfair, like asking a parent who their favorite child is! It’s hard not to say the front stairwell, because it’s stunning. And the pocket doors are incredible, too. I also am completely in love with rooms that aren’t square, and we have turrets and bays and nooks….. I love that each room has its own identity, and is completely unique. You have quite the unusual bucket list! Unlike others that are a list of places to see or things to do, yours centers around renovations and the like. I personally love this one: 58. Host a dinner party based on the movie “Clue.” Though not technically a renovation goal, it’s an important moment for the house, nonetheless. What do you plan to knock off the list next? #12 : Build a Piece of Furniture from Scratch. I’ve designed a wardrobe for the front bedroom, and Doug has figured out all the plans to make it work. We’re both super excited and nervous! Also, that “Clue” dinner party is going to be outstanding. Someday. Do you have any advice for anyone else about to buy and renovate their first home? What do you wish you knew the first time around? Take your time. Life isn’t a renovation show on TV – you don’t have to do every room at once (though, I can understand how that would be quicker and easier). Reuse and repurpose everything you can. The cabinets that you hate in your kitchen could be the exact perfect thing when painted cream for your laundry room (thanks, Mom and Dad for the cabinets!). Restore and renovate a house for YOU, not for who will buy it later. You should feel joy every time you walk into a space, and it should inspire you to create and love your home. The first time around, I wish I wasn’t so nervous about BIG projects, like kitchens and bathrooms. Bathrooms are now my absolute favorite thing to do, and I’m already hoping I can design for other people once my five (!) are done. Because I love them SO MUCH. Also, don’t be scared of paint or color. If you are, find a fabric or a scarf you love with multiple colors, and use those colors to create a room. You already love them together. Is it hard to work on house projects with your husband? Are you usually on the same page or have you decided who gets dibs on what? Oh, it’s totally easy, and anyone who has helped us on our house can vouch for that. If we didn’t love working together, it wouldn’t be nearly as much fun, and we wouldn’t do it! The only times we get cranky are late at night, when I REALLY want to keep working and he REALLY wants sleep. He loves figuring out the puzzle of putting a room together – the electrical and the plumbing, or the way a window is pieced together. I’ll come up with ideas for what I want, and throw them at him, and he just stares and says, “That’s an interesting idea…” and you can completely watch the gears inside his head begin to move. He went to Purdue, and I swear before your get your diploma there you have to pass multiple tests in “Logically Build This Thing.” I majored in music, so I’m the opposite. Or, as Doug puts is, “I like to live entirely inside the box. It’s nice in there. She’s never even looked at the box, she’s so far outside of it.” We really do compliment each other perfectly, and I think that shows in our work. If it’s ever not fun, we won’t keep doing it. Now, about YOU! If you had a day off, an entire day all to yourself, what would you do? I’m super social, and a band director, and I spend most of my days with a ton of AMAZING middle and high school students. And probably because I’m so busy and always around people, if I have time off, I really do enjoy being a homebody every once in a while and just being quiet. For me, that’s still fairly busy. I’d make breakfast for every meal, catch up on reading magazines, watch a movie I’ve seen a million times, and sit in one of the 19 rooms that aren’t done yet and start brainstorming. And then probably make a milkshake. Are you an avid reader? What are a few of your all-time favorite books? Yes, even renovation books count. this summer, and it’s fascinating. Truly, it’s amazing that anyone survived the Victorian Era. In the fiction world, I adore Gregory Maguire’s books, because I love the idea of finding out the other side of a story. Is there anything else that people should know about you two or your blog? Visit and chat! We love (and are amazed) when people love our work, but we’re so excited to learn about other people and what they are doing! We’d love to hear all about other people’s homes and stories and projects! Was that fun or what? Amy shares detailed accounts of her renovation progress and her tips for a successful finished product! I know you will love following along in the adventures of the Heavlin family. Hopefully, it will serve as an eye-opener so folks will stop building another new house and, instead, look for something worth saving in their own town or city. They just don’t make them like they used to.